The writeup below is contributed by Miss Elsie Liew and her cousin, Miss Michelle Toh, who are our current Contemporary Dance students. They are the pioneer batch, and have been learning from Teacher Teresa since LA started. P/S: I am proud of u girls, too! Where do I get to know about LA? Thanks to my sister, Li Yeng, who joined LA’s first holiday workshop with my cousin sister, Michelle Toh. They came back and started to practice and to my surprise my sister can DANCE! She has no background or close to dance. I still remember whenever Pussycat Dolls – Button plays, I will refer it to both of Michelle and Li Yeng and it makes me want to dance. So, one day I took the initiative to find out everything I needed to know and 3 of us joined the contemporary dance in December 2006. I’m proud to say that I was Teresa’s first batch of students. Why LA? I remember asking Teresa why there are no mirrors in the studio like others do. She told me that she do not want her students to compete with each other by looking at the mirror. She wants all her students to feel and dance confidently. What she said was very true as all of us have our own style. Another thing I love about LA is the wide and spacious studio. In the past, I have visited several dance studios that are comparatively smaller and had lower ceilings which restrict our movements. In LA, students are put in small groups (less than 10) so they can concentrate better and the teacher can focus on everyone. Teresa is friendly and very, very and I repeat very patient to have a student who forgets her steps in each and every class – ME. But eventually, she told me that I am improving in the 2nd semester. And from the 2nd semester onwards, I can remember most of the steps (although I still forget it, hehehe). 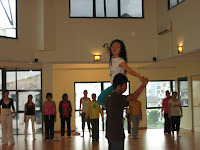 For the past 6 months, I learnt what is contemporary – it differs from other dance and there is no specific form to it. And best of all, I got a patient teacher Teresa for a slow learner like me. Last but not least, I am proud to be part of LA’s family. BRAVO to everyone! I got to know LA through a leaflet, and that particular leaflet is about the December holiday workshop. Coincidently, I was on holiday so I gave it a try. During those 3 days, I went home drenched with sweat and a body full of aches. Besides that, it was all fun. I knew that LA is the studio that I would like to go to. So, I signed up for contemporary dance because I like the gracefulness of the dance. I chose LA because they do not have mirrors (hooray!). With me being plump, I don’t get to see myself in the mirror and become self-conscience of my body shape. Without mirrors, I can fully concentrate on my movements. The high ceilings and open windows also allowed me to dance comfortably because I do not huff and puff after class as I have fresh air circulating in my lungs rather than air-cond. Now that I have been with LA for 3 semesters doing contemporary dance, I have more confidence in myself. Thanks to teacher Teresa, who is often patient in guiding me. Being in contemporary dance, I do not only learn the steps. I also learnt how to correct my body posture, alignment and improve my creativity. Sometimes we are given a game where we are required to explore movements together with the music. These games enhance my creativity. It is so fun being in dance class and that makes me look forward to dancing every day. Being part of LA’s family makes me very proud. As long as I can dance, I would always be a part of LA.